New Delhi: Himachal Pradesh to get about 200 million units of electricity at Rs. 0.30 per unit from the Renukaji Multipurpose Dam Project. It would earn net revenue of about Rs. 60 crore per annum to HPPCL and Rs. 12 crore to the state government in its first year of operation. These revenue benefits would further increase over a period of time. The dam will augment water availability for Delhi, Haryana, Uttar Pradesh, Himachal Pradesh, Uttarakhand and Rajasthan. The project will also generate 40 MW of power during peak flow. For the construction of the Renukaji Multi-Purpose Dam project, Nitin Gadkari, Union Minister today signed a Memorandum of Understanding (MoU) with the six states including Rajasthan, Haryana, Uttar Pradesh, Uttarakhand, Delhi and Himachal Pradesh. Himachal Pradesh is to bear the 10 percent cost of power house, while Delhi government would bear 90 percent cost. Renukaji Dam project has been conceived as a storage project on Giri River in Sirmour District of Himachal Pradesh. The project envisages construction of 148 M high rock filled dam for supply of 23 cumec water to Delhi and other basin states. The project will generate 40 MW of power during peak flow. The project is proposed to be executed by Himachal Pradesh Power Corporation Ltd. (HPPCL). The live storage of Renukaji MPP is 0.404 MAF and total submergence area is about 1508 hectares in the territory of HP. After the construction of the dam, the flow of river Giri will increase about 110% which will meet the drinking water needs of Delhi and other basin states up to some extent in lean period. Stored water of Renukaji Dam will be used by UP, Haryana & NCT of Delhi from Hathnikund Barrage, by NCT of Delhi from Wazirabad Barrage and by UP, Haryana and Rajasthan from Okhla Barrage. Investigation works in respect of Renukaji dam project was started in 1976. However, the construction works could not started. The total cost of the project was estimated on Price Level 2015 is Rs. 4596.76 Crores out of which the cost of irrigation/drinking water component is Rs. 4325.43 crores and the cost of power component is Rs. 277.33 crore. The 90% cost of irrigation/drinking water component of the project i.e. Rs. 3892.83 crore will be provided by the Central Govt. and rest 10% of the above cost i.e. Rs. 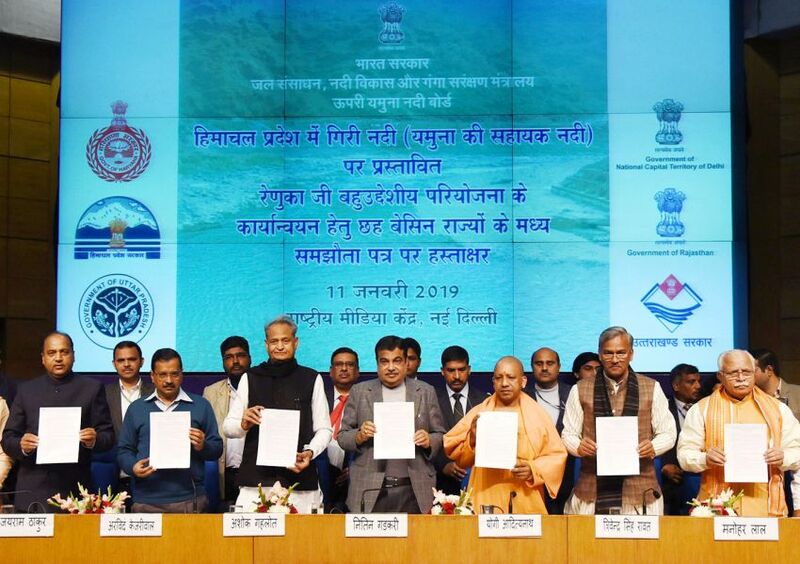 432.54 crore will be provided by the basin States of Haryana, UP/UK, HP, Rajasthan & NCT of Delhi in the proportion as allocated in MoU dated 12.05.1994 signed by the CMs of the basin states for the allocation of surface water of river Yamuna up to Okhla Barrage. The shares of these states viz. Haryana, UP/UK, HP, Rajasthan and NCT of Delhi are 47.82%, 33.65%, 3.15%, 9.34% and 6.04% respectively. Govt. of NCT of Delhi has agreed to fund 90% of the cost of power component of the said project. All the mandatory clearances in respect of Renukaji dam project except Stage-II forest clearance, invest clearance and approval from CCEA have been obtained. Renukaji Dam project is part of three storage projects which are proposed to be constructed on the river Yamuna and two of its tributaries – Tons and Giri in the hilly regions of Uttarakhand and Himachal Pradesh of Upper Yamuna Basin. The other two include Lakhwar project on River Yamuna and Kishau project on River Tons. An agreement in respect of sharing of cost and benefits of Lakhwar Multi Purpose Project amongst among basin States viz. Uttarakhand, Himachal Pradesh, Haryana, Uttar Pradesh, Rajasthan and NCT of Delhi was signed by the Chief Ministers in the presence of Shri Nitin Gadkari, Union Minister, Water Resources, River Development and Ganga Rejuvenation at New Delhi on 28th August, 2018.